How will this team structure template help me? We’re often asked what the ideal digital marketing team looks like and how it integrates with the broader marketing organisation. This will naturally depend on the type of business and its size, but there are some common activities that need to be managed. The aim of this template is for you can compare these structures to your current situation to help plan future changes. 1. Integration - embedding ‘digital marketing activities’ within marketing and the business. 2. Activities and roles - key strategic and tactical digital marketing activities and roles. 3. Digital Marketing Centre of Excellence (DCoE) - Activities and tools which should be managed centrally in larger organizations. What are the structures based on? 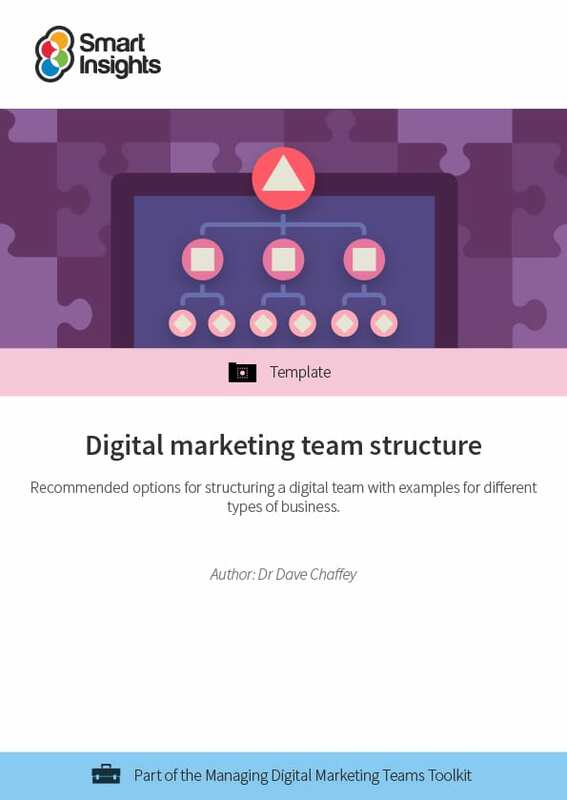 The recommended structures are based on real team structures from companies our analysts have worked with when consulting or producing our Digital Transformation research reports. These projects include companies in a range of sectors including travel, retail, financial services and business-to-business. We also review how digital teams need to be integrated with traditional brand, product and marketing communications teams. The examples vary from the skills required from a ‘one person team’ to medium and large international companies. Typical job titles are also based on a review of roles from recruitment agencies and job sites aggregating jobs from different recruitment agencies. Dave is co-founder and content director of Smart Insights. He is editor of the 100 templates, ebooks and courses in the digital marketing resource library created by our team of 25+ Digital Marketing experts. Our resources used by our Business members in more than 100 countries to Plan, Manage and Optimize their digital marketing.